Residents in the Garden State will soon be seeing more solar panels. PSE&G is moving forward with a big solar energy project with a hefty price tag. It is the wave of the future — Solar Power, Renewable Energy, all thanks to the sun. On Tuesday, PSE&G unveiled a $773 million project to position solar panels atop schools and municipal buildings in New Jersey, and of all places, utility poles. "PSE&G is actually on the cutting edge with regard to alternative energy sources and they're also helping, as the state is, very aggressively moving towards what President Obama talks about weatherization," New Jersey Governor Jon Corzine. 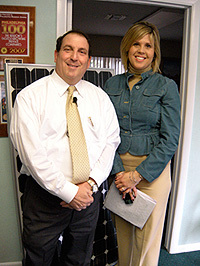 "I think it could work for New Jersey," said Stephen Masapollo of Solar Works NJ. Masapollo sells and installs solar panels and says the project will create jobs. "The phone hasn't rung yet, but I'm hoping," said Masapollo. Once approved by the board of public utilities, PSE&G would install the panels over five years. Utility customers in Mercer, Camden, parts of Burlington and Gloucester counties will likely see an increase of 10 cents each month during the first year, and then a 10 to 35 cent increase on monthly bills the following four years. It will produce a tremendous amount of energy and send it right to the power grid. "A 120 megawatts is a lot of electricity; on the other hand, I do wonder how much of a benefit the ratepayer is actually going to see" said Masapollo. In the long term, customers will rely on cleaner, less expensive electricity. "We'll have savings in health cause we won't have asthma, we'll be less dependant on foreign oil," explained Corzine.